Mar 14 Flying on Flight Hello Kitty! 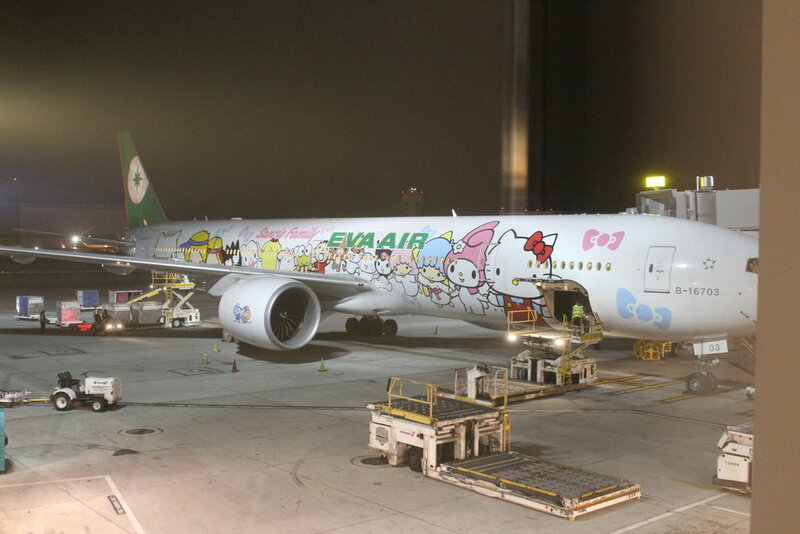 The international Hello Kitty Eva Airlines Flight has finally come to America! When I read about its debut, I knew I had to book it for my next international flight! I had gone on a EVA Air Hello Kitty domestic flight before from Taiwan to Hong Kong, but that was 3+ years ago. I was very excited to see how the international flight from LAX (Los Angeles) to Taiwan would be and how it would compare to its domestic Asian counterpart. EVA Air and Sanrio teamed up to create special designs for their international Hello Kitty planes. Every so often, EVA Air changes the design and theme of the Hello Kitty aircraft and the subsequent inside decor of the plane. They have 6 designs to choose from. I was on the hand-in-hand themed one where Hello Kitty and all her character friends are happily holding hands. Identify your bags with your Hello Kitty name tag! This is the same tag they give on the domestic flight. You can be sure that security will be nicer to your bags with this kawaii Hello Kitty fragile sticker on your belongings! Your baggage sticker tags are as well. There's a cute little Sanrio shop right across from your boarding gate. Very fitting, although I must say the Hello Kitty shop at the Taiwan Airport spanks this by miles. No comparison at all. This US one is brand new too. C'mon guys, let's step up our game!!! Here's my Hello Kitty pillow. The pillow matches the Hand-in-Hand theme on the outside of the plane. My pillow. It's worth nothing that the pillows and headrest piece are different depending on what class you are sitting on. This was on the Elite Class. I will be returning on Business Class to accurately share the differences in decor and service. Each Hello Kitty flight has different limited edition items you can only purchase on that particular flight. If you ask for it, they also have complimentary puzzles and playing cards they offer flyers to pass time. The puzzles and cards also go with the theme of the plane. Safety pamphlets are a lot cuter with Hello Kitty! The Hello Kitty Food and Drink Menu. Alcoholic drinks come with a Hello Kitty bow stir. Flight attendants wear a green Hello Kitty scarf and a pink Hello Kitty apron when serving food. Food wise, nothing blew my mind. The only food that was Hello Kitty was the carrot piece. Plastic Hello Kitty Silverware. It's worth nothing that the silverware on the Business and First Class seats are not plastic. Will report back on what those look like on my return flight. Hello Kitty sugar packs and also Hello Kitty toothpicks. Nothing special. It's just the outside that's HK. Inside the bathroom are Hello Kitty amenities. You have soap, moisturizing mist, lotion, etc. Wash your hands with Hello Kitty soap, moisturize with Hello Kitty lotion, and spray your face with Hello Kitty mist. Feel nausey? There are Hello Kitty vomit bags as well. You didn't think you'd be wiping with regular toilet paper, did you? Plastic cups inside the lavatory and outside used for drinking are also Hello Kitty. Actually, it's Hello Kitty dressed in Eva Air flight attendant uniforms. Time for the second meal of the flight. There they go with the carrot again! At least this time it looks a tad more like Hello Kitty. The previous carrot looked sad. Here's a Hello Kitty carved fruit piece. Ehh... the food on the domestic Asian Hello Kitty flights were much cuter. False advertising. Your earphones come in a Hello Kitty plastic bag, but alas, that is it. They are not Hello Kitty earphones. My impression was that depending on what class you are sitting in on the international long haul flight, your Hello Kitty experience will vary immensely. This was a big change from my previous experience on the domestic flight. Even the TVs were Hello Kitty and blankets. The rice was also in the shape of Hello Kitty's head. During the flight, I took a stroll back to the Economy class to check things out. There was barely any Hello Kitty back there. The theme seemed like an afterthought. It would be a shame if you sat in the Economy class for the Hello Kitty flight since there's a possibility you wouldn't even notice the HK theme. I was on the Elite Class of EVA Air so I’ll be returning to the States on Business to get the Hello Kitty experience and see what the difference is. FYI: I'm not Hello Kitty obsessed by any means. I just enjoy cute things, but if you're gonna do a theme, you need to do it well!